Former Gov. Roy Barnes and former Lt. Gov. Mark Taylor held a Capitol reunion of sorts Thursday, getting together for a press conference to support John Edwards' presidential campaign. Barnes served as governor, with Taylor as his second-in-charge, from 1999 to 2003. Taylor served another four years as lieutenant governor before running unsuccessfully for governor last year. Joining Barnes and Taylor at the event were several other elected officials, including two African-American state senators, Valencia Seay (D-Riverdale) and Vincent Fort (D-Atlanta). Last week, Democratic frontrunner Hillary Clinton was in Atlanta touting her endorsement from black U.S. Reps. John Lewis. Barnes said Southern Democrats have too often had to tip-toe around their nominees because they weren't popular in the region. He said that won't be the case with Edwards, a former U.S. senator from North Carolina. 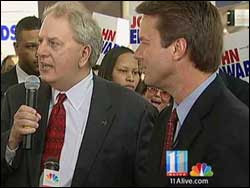 "I am ready for a president that talks like I do and I can understand without an interpreter," Barnes added. Barnes said Clinton will have a difficult time winning the general election because so many Americans have a negative view of her. "Whether we like it or not, she's a polarizing figure and I think she would have a very difficult time being elected and governing," he said. Taylor said, "I am ready for a president who can bring people together."